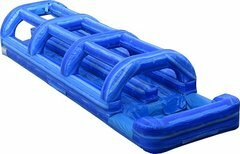 Cool off the kids this summer with this 30ft. long 2 lane Slip-n-Slide. Give the kids something to really enjoy at your next event, while entertaining all your guests on this awesome 2 lane Slip-n-Slide. Who knew you could have so much fun in your own backyard!! !